Researchers at Columbia University Medical Center (CUMC) have devised a hair restoration method that can generate new human hair growth, rather than simply redistribute hair from one part of the scalp to another. The approach could significantly expand the use of hair transplantation to women with hair loss, who tend to have insufficient donor hair, as well as to men in early stages of baldness. The study was published today in the online edition of the Proceedings of the National Academy of Sciences (PNAS). "About 90 percent of women with hair loss are not strong candidates for hair transplantation surgery because of insufficient donor hair," said co-study leader Angela M. Christiano, PhD, the Richard and Mildred Rhodebeck Professor of Dermatology and professor of genetics & development. "This method offers the possibility of inducing large numbers of hair follicles or rejuvenating existing hair follicles, starting with cells grown from just a few hundred donor hairs. It could make hair transplantation available to individuals with a limited number of follicles, including those with female-pattern hair loss, scarring alopecia, and hair loss due to burns." The source of new hair: For the first time, researchers have been able to take human dermal papilla cells (those inside the base of human hair follicles) and use them to create new hairs. Image: Claire Higgins/Christiano Lab at Columbia University Medical Center. According to Dr. Christiano, such patients gain little benefit from existing hair-loss medications, which tend to slow the rate of hair loss but usually do not stimulate robust new hair growth. "Dermal papilla cells give rise to hair follicles, and the notion of cloning hair follicles using inductive dermal papilla cells has been around for 40 years or so," said co-study leader Colin Jahoda, PhD, professor of stem cell sciences at Durham University, England, and co-director of North East England Stem Cell Institute, who is one of the early founders of the field. "However, once the dermal papilla cells are put into conventional, two-dimensional tissue culture, they revert to basic skin cells and lose their ability to produce hair follicles. So we were faced with a Catch-22: how to expand a sufficiently large number of cells for hair regeneration while retaining their inductive properties." The researchers found a clue to overcoming this barrier in their observations of rodent hair. Rodent papillae can be easily harvested, expanded, and successfully transplanted back into rodent skin, a method pioneered by Dr. Jahoda several years ago. The main reason that rodent hair is readily transplantable, the researchers suspected, is that their dermal papillae (unlike human papillae) tend to spontaneously aggregate, or form clumps, in tissue culture. The team reasoned that these aggregations must create their own extracellular environment, which allows the papillae to interact and release signals that ultimately reprogram the recipient skin to grow new follicles. "This suggested that if we cultured human papillae in such a way as to encourage them to aggregate the way rodent cells do spontaneously, it could create the conditions needed to induce hair growth in human skin," said first author Claire A. Higgins, PhD, associate research scientist. To test their hypothesis, the researchers harvested dermal papillae from seven human donors and cloned the cells in tissue culture; no additional growth factors were added to the cultures. After a few days, the cultured papillae were transplanted between the dermis and epidermis of human skin that had been grafted onto the backs of mice. In five of the seven tests, the transplants resulted in new hair growth that lasted at least six weeks. DNA analysis confirmed that the new hair follicles were human and genetically matched the donors. "This approach has the potential to transform the medical treatment of hair loss," said Dr. Christiano. "Current hair-loss medications tend to slow the loss of hair follicles or potentially stimulate the growth of existing hairs, but they do not create new hair follicles. Neither do conventional hair transplants, which relocate a set number of hairs from the back of the scalp to the front. Our method, in contrast, has the potential to actually grow new follicles using a patient's own cells. This could greatly expand the utility of hair restoration surgery to women and to younger patients -- now it is largely restricted to the treatment of male-pattern baldness in patients with stable disease." More work needs to be done before the method can be tested in humans, according to the researchers. "We need to establish the origins of the critical intrinsic properties of the newly induced hairs, such as their hair cycle kinetics, color, angle, positioning, and texture" said Dr. Jahoda. "We also need to establish the role of the host epidermal cells that the dermal papilla cells interact with, to make the new structures." The team is optimistic that clinical trials could begin in the near future. "We also think that this study is an important step toward the goal of creating a replacement skin that contains hair follicles for use with, for example, burn patients," said Dr Jahoda. The researchers used gene expression analyses to determine that the three-dimensional cultures restored 22 percent of the gene expression seen in normal hair follicles. "That's less than we expected, but it was sufficient for inducing the growth of new hair follicles," said Dr. Christiano. 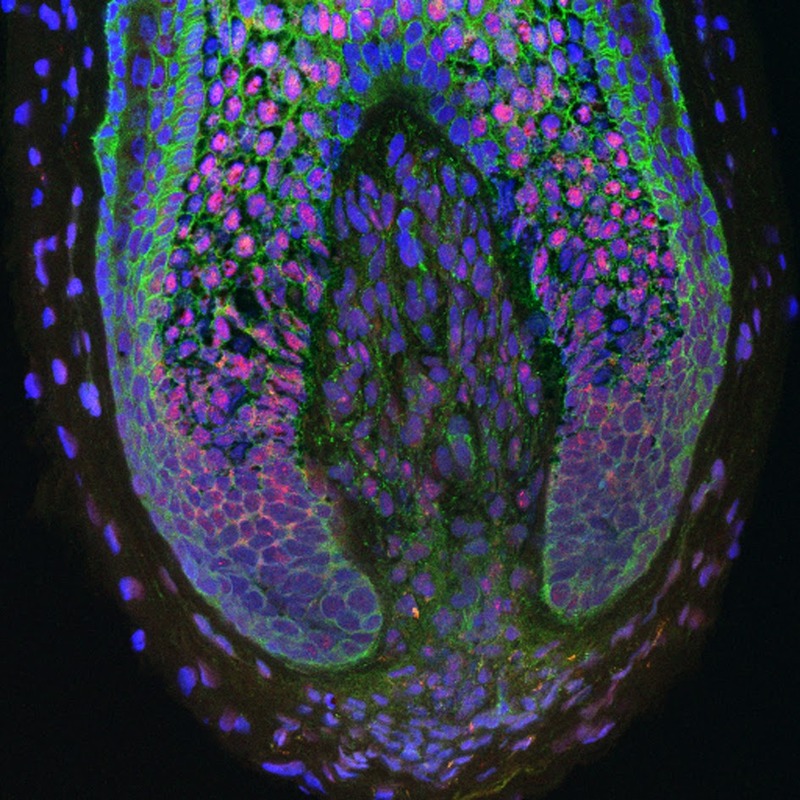 In addition, using methods for the analysis of regulatory networks developed by the Califano lab in the Center for Computational Biology and Bioinformatics, Department of Systems Biology, the researchers identified a number of transcription factors (gene regulators) that have the potential to mimic the environmental signals that trigger papillae to induce new hair growth. This information could help researchers develop ways to restore the expression of more genes involved in hair growth and to increase the efficiency of the induction. The paper is titled, "Microenvironmental reprogramming by three-dimensional culture enables dermal papilla cells to induce de novo human hair follicle growth." The other contributors are James C. Chen and Jane E. Cerise, both at CUMC. The study was supported by a Science of Human Appearance Career Development Award from the Dermatology Foundation and by grants from the Medical Research Council of the UK, the Empire State Development's Division of Science, Technology and Innovation (NYSTAR), New York Stem Cell Science (NYSTEM), and the Biotechnology and Biological Sciences Research Council in the UK (BBSRC), as well as earlier support from the Steven and Michele Kirsch Foundation. Dr. Christiano is a member of the Columbia Stem Cell Initiative.